Kevin Harvick nosed out Mark Martin in a frantic wreck-filled finish to win Sunday's Daytona 500. Martin, making his 23rd attempt at a 500 win, seemed to have victory in hand when a hard-charging Harvick barreled along the outside to earn his second victory at Daytona International Speedway in two days. 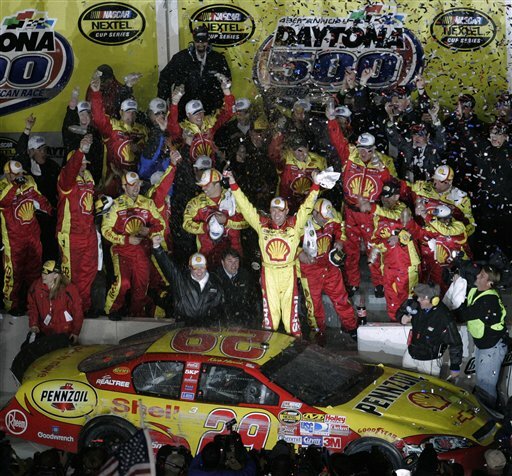 Harvick won Saturday's Busch race _ his first victory at Daytona. "My go-kart experience over the winter paid off, because I didn't let off the floor and we just kept hitting things and the wall and bouncing off everything," Harvick said. "But man, this is the Daytona 500. Can you believe it?" Martin finished second, followed by Jeff Burton, Harvick's teammate, and Mike Wallace, who raced his way into the 500. Fifth place was rookie David Ragan, the kid who replaced Martin when he left Roush Racing this winter after 19 seasons. It took several moments for NASCAR to declare the winner, finally giving it to Harvick and spoiling what would have been the biggest victory of the 48-year-old Martin's career. He's easing into retirement, and just left powerhouse Roush to run a partial schedule with Ginn Racing _ a second-tier team bought last year by a Florida land developer trying to satisfy his love of NASCAR. "I didn't ask for a win in the Daytona 500, I asked for a chance," Martin said. "I let it slip away, slip through my fingers, and I'm fine with that. I am very proud of what this team did for me this weekend." Five teams were busted for breaking the rules during Speedweeks _ including two-time winner Michael Waltrip, who broke the NASCAR code by tampering with his fuel before qualifying and humiliated Toyota in its Nextel Cup debut. When racing resumed with two laps to go, Martin seemingly needed only to hold off Kyle Busch in a sprint to the finish. He weaved high and then low to block Busch's attempts, which may have distracted him from Harvick. Before the frantic finish, the race was shaping up to be a fight to the finish between Tony Stewart and Kurt Busch, who combined to lead 130 of the 200 laps. But they wrecked each other while leading the race with 48 laps to go. Stewart was leading coming out of the fourth turn when his Chevrolet wiggled just a bit. Busch, closing fast, couldn't avoid running into Stewart's bumper, and both cars careened into the outside wall. Busch, who led 95 laps in his bid to give car owner Roger Penske his first Daytona 500 win, was heartbroken. "We both got taken out of the Daytona 500 on my mistake," he said from inside his car. "I made the first mistake. I apologize to (Stewart), but I know that doesn't mean anything now." Stewart, who led early but dropped to the back of the field ater a pit road miscue, led 35 laps and just had surged back to the front when he wrecked. It dropped Stewart to 0-for-9 in Daytona 500s, a streak he was determined to snap when he reported to Speedweeks intent on adding the race to his impressive resume. After winning the Budweiser Shootout exhibition race and a qualifying event Thursday, Stewart had established himself as the favorite and said he'd trade all 11 of his Daytona victories to just win the 500 once. It appeared to be his race to lose, and he knew it _ saying on pit road before the start "this is the best chance I've ever had, the best car I've ever had." He was surprisingly calm and collected after wrecking. "It just wasn't meant to be today," he said with a smile. "I'm still disappointed, but we've got a lot to be proud of. We had an awesome Speedweeks."